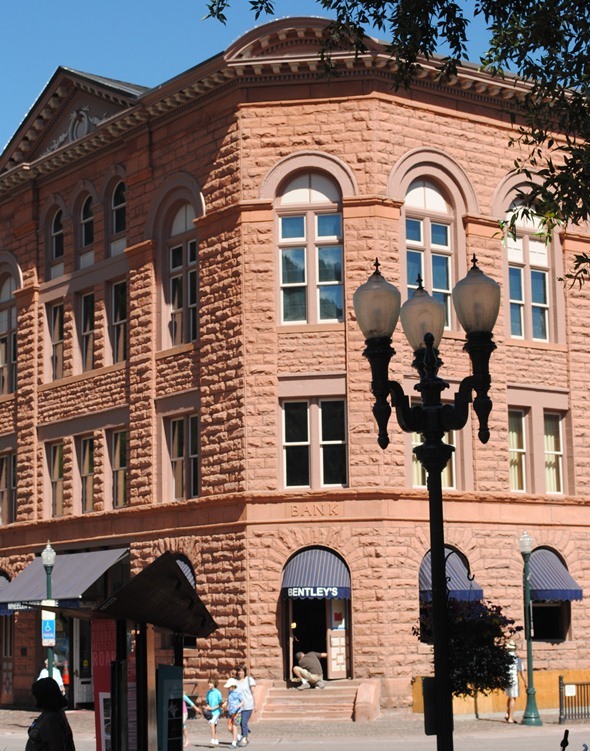 The three-story building was a blend of Romanesque and Italianate styles with walls of local peachblow sandstone. Retail spaces were located on the first floor, professional offices were on the second, and the theater occupied the entire third floor. The opera house was built by Jerome B. Wheeler, who had made his fortune with the Macy’s department store and had invested in silver mines around Aspen. Later that same year, 1889, Wheeler would open the lavish, European-style Hotel Jerome. The silver crash four years later devastated Aspen’s economy, and the Wheeler Opera House limped along until November 1912, when an early-morning arson fire seriously damaged the building. The opera house was boarded up, and the City of Aspen bought it in 1918 for $1,155, the amount of the back taxes due on the building. Aspen’s renaissance at the hands of Chicago industrialist Walter Paepcke, the driving force behind both a new ski area and a new music festival, led to a new life for the Wheeler in the late 1940s as Bauhaus architect Herbert Bayer redesigned the interior with a bare-bones stage, a simple orchestra shell, and benches for seating. In the 1960s, Bayer again led a remodeling project, replacing the benches with movie seats, adding box seats and a gold velvet curtain, and restoring the coffered ceiling, all in a blend of Bauhaus and Victorian styles. The Wheeler got yet another round of remodeling in the 1980s with a goal of returning to Jerome Wheeler’s original vision while respecting the historic designation achieved for the building in 1976. Many of the original features, box seats, a proscenium arch and a Victorian-era fire curtain, were restored, with the second floor being established as the theater’s lobby and a theater bar and a box office taking up the ground floor. The Wheeler Opera House emerged as an Aspen institution that is in use 350 days a year, located in the heart of Aspen on the corner of Hyman Avenue and Mill Street.